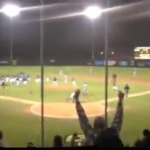 On a night in which UC Santa Barbara students partied, Cal Poly baseball fans and players celebrated. With one out in the bottom of the ninth, Cal Poly senior catcher Chris Hoo singled up the middle, driving in the winning run in an 8-7 walk-off victory over the visiting Gauchos. The Mustang win evened the weekend series between 5th-ranked Cal Poly and 17th-ranked Santa Barbara. One hundred miles to the south Saturday, Santa Barbara students and others took to the streets of Isla Vista for a day-to-night booze-filled block party known as Deltopia. The Gaucho baseball squad likely took the field Saturday evening focused on the task at hand, but it experienced a two-inning hangover from its Friday night victory and spotted the Mustangs five runs. Trailing 5-0 in the top of the fourth, Gaucho hitters pounded Mustang freshman starter Justin Calomeni. The freshman righty surrendered five runs in the inning while only recording one out. Santa Barbara added another run in the inning, charged to freshman reliever Nick Suniga, and took a 6-5 lead. Calomeni did not walk a batter over three and a third innings, but he allowed 11 hits. All five runs charged to Calomeni were earned. In the bottom of the fourth, Cal Poly reclaimed the lead on a two-out, two run single by left fielder Tim Wise. Santa Barbara responded with one in the fifth to tie the game at seven. Sophomore Gaucho reliever Kenny Chapman held Cal Poly scoreless over four and a third innings, and Mustang closer Reed Reilly pitched a scoreless 7th, 8th and 9th before Hoo ended the game with his RBI single. To start the bottom of the ninth, Santa Barbara reliever Dillon Hecht issued a leadoff walk to Cal Poly first baseman Ryan Drobny. Brett Barbier then pinch ran for Drobny, and shortstop Peter Vangansen sacrificed him to second. Gaucho coach Andrew Checketts then replaced Hecht with flame-throwing closer Dillon Tate, who had overpowered Mustang hitters while earning a save Friday night. But, on the second pitch Tate threw Saturday, Hoo singled up the middle scoring Barbier. Hoo’s walk-off hit came one night after Tate struck him out to end the game. With the victory, Cal Poly improved to 25-5 overall and 4-1 in the Big West. Santa Barbara is now 20-6 and 2-3 in the Big West. The series rubber match will take place Sunday at 1 p.m. at Baggett Stadium. Undefeated sophomore righty Casey Bloomquist will take the mound for the Mustangs against Gaucho freshman right hander Shane Bieber.